Weezer is one of the most iconic alternative bands from the 90s. They became very famous after their debut album the Blue Album and their second album was awaited with much anticipation. Their second album, Pinkerton, was very unsuccessful upon its release. Over time it has become a well respected album in alt rock history, and many critics have gone back on their initial review of the album. 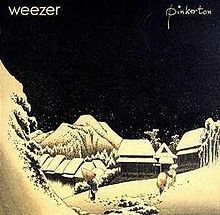 In this episode we will listen to the Blue album and Pinkerton.